Just minutes away from George West and Three Rivers, you’ll find this beautiful property on top of a majestic hill. 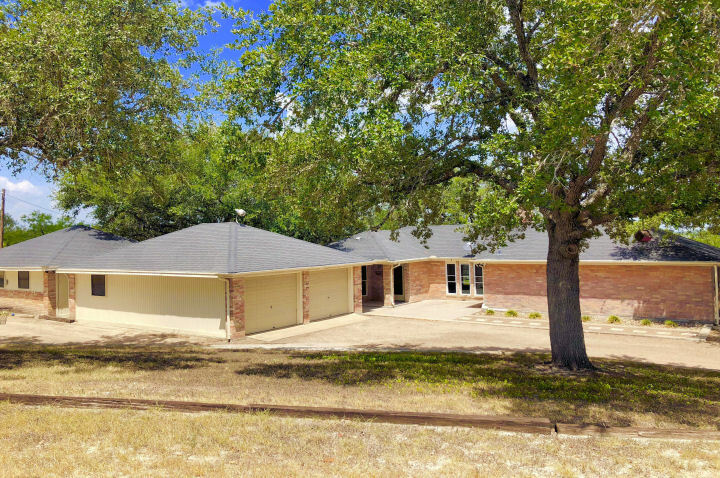 The residence at 122 CR 308, George West, Texas 78022 lets you thrive in a peaceful park-like setting with mature live oak trees, plenty of indoor and outdoor space, and professional xeriscaping, a form of landscaping that either minimizes or eliminates the need for irrigation. With 3 bedrooms and 2 bathrooms, the home offers 1,997 square feet of living space. It is situated on an oversized lot that measures 2.188 acres. You can spend time outdoors or opt to enjoy the company of friends and family in the warm interior of your home. Whatever your preferred home activities are, this property is the perfect place for these. This desirable piece of real estate is for sale at an incredible bargain. An expansive lawn greets guests as they walk up the main house. A door with glass panels opens into a cozy living room where you can entertain friends and family. An accent wall has been painted a lovely green color and adds character to the room. A ceiling fan provides comfort from the Texan heat. The double-hung windows have been outfitted with Venetian blinds to protect your privacy and offer shade from the sun. Part of the living room floor is covered with plush carpeting, giving it a luxurious feel, while the other rooms are covered in tiles. The highlight of the living room is the wood burning fireplace, which is flanked by built-in cabinets, offering sufficient storage space for books, photo albums, and other personal effects. Above the fireplace hangs an exquisite shelf with Mediterranean tiles. However, the eat-in kitchen is undeniably the heart of the home, with its built-in banquette, custom cabinetry, cook top range, and trash compactor. It’s a wonderful place to meet and catch up with other family members while getting ready for meals. There is a formal dining room just off the kitchen, which is perfect for hosting dinner parties and celebrating special occasions. Another highlight is the spacious master suite that comes with its own bathroom. This is a place where you can truly get away from it all. The other two bedrooms are just as spacious and luxurious, with carpeted flooring and large walk-in closets. The second bedroom, in particular, features a sturdy custom desk and can serve as a private office. Elsewhere on the property, you’ll find a 600-square-foot detached building with tile flooring, which can be converted into a game room or in-law quarters – the possibilities are endless. A covered walkway leads from the main house to a 720-square-foot two-car garage that has a separate service entrance. 122 CR 308 is on the market for $262,500 – a steal considering its pristine condition and choice location. If you think this should be your next home, Desert Flower Realty would be happy to assist you. Call me, John Walker, at 361-449-2051 or send an email to DesertFlowerRealty(at)DesertFlowerRealty(dotted)com. Located in Live Oak County, George West is situated on the crossroads of US highways 281 and 59, roughly 63 miles northwest of Corpus Christi. Called “The Storytelling Capital of Texas,” it hosts the annual George West Storyfest, a long-running tradition featuring live music, cowboy poetry, and more. Major attractions include the Grace Armantrout Museum, Buck West House, Lake Corpus Christi, and Choke Canyon Reservoir. The home is located 3.5 miles from George West and 7.5 miles from Three Rivers. From IH-37 and Highway 59, head west on Highway 59 for roughly five miles before exiting on Business 59, which takes you to Houston Street. Follow Houston Street for about a mile to Highway 281. Turn right on Highway 281, then head north for 2.74 miles before turning right onto CR 306. Turn left on CR 308 – you’ll find this gorgeous property on the right.